As a native of South America, tomato plants are warm-season tender vegetables that require warm day and nighttime temperatures to flourish and set fruit. Nighttime temperatures below 40 degrees Fahrenheit can easily damage all parts of the plant, including stems, leaves, flowers and fruit. Setting out plants prior to the last frost date in any given area is to risk an overnight freeze that will kill young transplants. Tomatoes grow, flower and set fruit best at daytime temperatures between 70 and 75 degrees F and between 65 and 68 degrees at night. 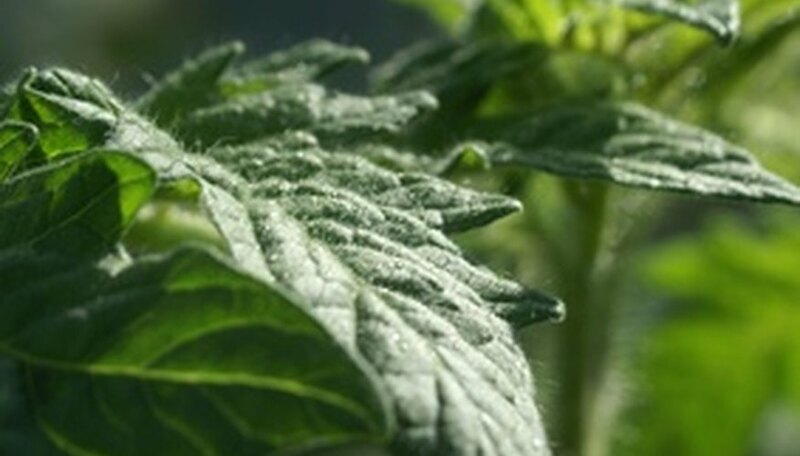 Temperatures around 50 degrees will retard growth and cause blossom drop, and below 40 degrees, the plant will show signs of cold damage. Excessive heat, however, can bring about equally undesirable outcomes. Temperatures over 85 degrees cause problems with pollen production and reduce fruit set. Temperatures over 95 degrees can cause fruit to stop growing altogether and ripen improperly. Tomatoes exposed to sufficiently cold or freezing temperatures are very vulnerable to damage. The most obvious sign of cold damage is on the fruit, which become soft and discolored, and on the leaves, which develop watery brown or black blotches. Cold-damaged leaves should be removed from the plant, which may yet recover from the freeze if only small sections of the plant were affected. The last frost date is a designated day in early spring after which a region can reasonably expect no more overnight freezes; this date generally ranges between March 15 and April 15, depending on the location. Tender plants like tomatoes, eggplants and peppers can usually be safely set out in the garden after this date. Northern latitudes have later last-frost dates than southern latitudes, which have the longest growing seasons because of later first-frost dates as well. The first-frost date is the earliest possible date overnight freezes occur in the autumn, ranging from September 15 to October 15 in most areas. When freezing temperatures are forecast, covering a plant with a blanket or sheet can provide limited protection only from a very light frost. Protect small transplants by covering them with an inverted plastic container or coffee can, making sure to remove it the following day, as the container will easily trap heat and can literally cook the tomato plant. Other products designed to protect tender plants during cold temperatures include floating row covers, cloches, water-walls and bubble wrap. If a hard freeze is forecast, the best course of action is to harvest all fruit from the plant. Green tomatoes can be used in relishes and sauces, and larger green tomatoes often ripen on their own if placed in a brown paper bag in a dimly lit pantry or shelf. Freeze-damaged fruit is still edible as long as the damaged areas are removed. Tomato fruit which shows any evidence of cold damage should never be canned, as bacteria present in damaged areas can survive the preserving process. How Long Does It Take to Grow Cherry Tomatoes?